Train rain ride to Davos with an African giant, or “Morgan Freeman” to some. It’s an understatement to say attending the World Economic Forum in Davos is a privilege. in this magical arena, unbelievable “only in Davos” episodes can and do happen. Including, for me, 40 minutes in a reception-room-on-wheels with an 80 year old African giant who passed away on Saturday. In 2009, shortly after arriving in the Alpine resort, one of Kofi Annan’s minders offered me time with the co-chair of that year’s WEF meeting. It required a hasty journey back to Landquart where Jeanette and I arrived just in time to meet a magnificent carriage laid on for him by the Swiss Railway. I spent the journey back to Davos asking, listening and making notes, while Jeanette massaged the famous man’s arthritic fingers (it’s what she does…). Mr Annan spoke passionately about the suffering of Zimbabweans and the impact of global warming, and with a self-deprecating smile, shared how he was often mistaken for Morgan Freeman. The passing of Africa’s most recognisable man after Nelson Mandela leaves a Kimberley-sized hole. 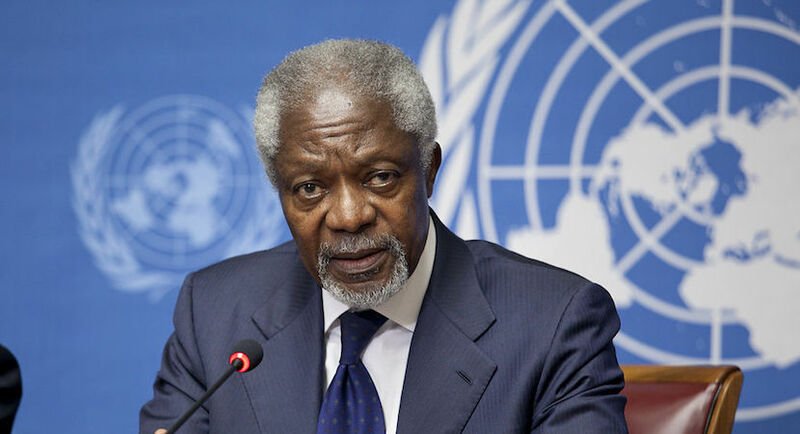 The Ghanaian icon’s life is being celebrated all over the world where millions remember him for his service during a decade as secretary general of the United Nations. For me, it is for this rational being’s dignity, humility and humour. And those gnarled hands. RIP great one. It’s a delicious irony that in a year when the World Economic Forum will be dominated by travails of the rich North, two of meeting’s six co-chairs are Sub-Saharan Africans. Lesser known of the duo is silky South African Maria Ramos. The former bank clerk impressed during the 1990s as Director General of Finance in an inexperienced ANC Government and, more recently, husbanded the unlikely turnaround of Africa’s largest logistics outfit, SA State-owned Transnet. For anyone who has been exposed to Ramos for an extended period, there can be little doubt her cocktail of sharp intellect, humble demeanour and ready smile is set to charm this most powerful annual gathering on earth. In the unlikely event of a stumble, Ramos can lean across to vastly experienced col-chair, Ghanaian Kofi Annan. 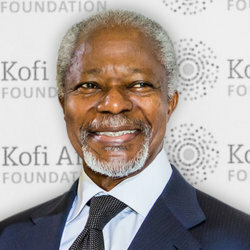 The first United Nations staffer to rise through the ranks to Secretary General, Annan held that highest of high profile positions for a decade. Second only to Nelson Mandela as the most recognisable African, like Madiba he, too, is a recipient of the Nobel Peace Prize (2001). After a series of “only in Davos” events yesterday, I ended up taking a 60km train journey north to Landquart, duly meeting up with Annan as he made his way to Davos in a special carriage laid on by the Swiss Railway. Annan is a head shorter than Mandela, and leaner in person than the imposing figure seen so often on global television. A clear skin and few wrinkles gives him a face which belies his 70 years. The WEF participants booklet describes Annan as one who “continues to advocate for better policies to meet needs of poorest and most vulnerable, particularly in Africa.” From the half hour we spent together, that’s as accurate a description you’ll find anywhere. Annan was in the headlines again in November when together with former US President Jimmy Carter and Graca Machel (Mrs Nelson Mandela) he made a very public attempt to visit Zimbabwe. Annan says Zimbabwean President Robert Mugabe blundered by blocking these “elder statesmen” from entering the country. Annan says he is working hard behind the scenes to help bring change to Zimbabwe. But what he is doing is very differently to the failed “quiet diplomacy” attempts by former South African President Thabo Mbeki. He also warns that companies taking advantage of Mugabe’s misrule are likely to rue their shortsightedness. A precedent, Annan says, is the example of Liberia where Ellen Johnson-Sirleaf’s democratically elected government revoked all concessions granted by the previous regime to businesses. While Annan is hopeful that a solution for Zimbabwe is not too far off, he is concerned about African hopes being tied too closely to new US President Barack Obama: “We need to lower our expectations. Obama is a good leader and has made some excellent appointments which will make a difference. But he is not a Messiah. “You are an African,” Annan told me. “You know how we Africans like to say ‘leave it in God’s hands’. But I believe it also helps if we do a little bit ourselves. Rather than waiting for Obama to solve things, leaders should ask themselves what can they do themselves; what can they do to engage him. For his own part, Annan is practicing what he preaches. Because of changing weather patterns, Annan says, old planting lessons from past generations don’t work anymore. That adds to the already enormous disadvantages for farmers on the continent: “African farmers are the only ones around the world who get no assistance. She – and I say she because most are women – sinks or swims on her own.” His organisation is helping to train thousands of agriculture dealers, who in turn provide advice to their faming clients on the right seeds to plant, prices being offered in various markets and correct fertilising. Annan’s flagship project, though, is a joint venture with Google, mobile phone companies Ericcson and Zain and the World Meteorological Organisation (WMO) to fill the “black hole” of weather information in much of the African continent. Helping emerging farmers time their plantings better and to be able to insure the crops for the first time is only part of the benefit. Annan says that in the Lake Victoria region, unexpected turns in the weather kills 5 000 people a year, mainly fishermen caught in storms when they are too far from shore. The innovative project plans to have 5 000 weather gathering devices installed onto Ericcson masts around the continent, linking their information to the WMO and Google. Through cell phone technology – simple SMS warnings or more sophisticated weather charts – the weather predictive information will be distributed into areas of Kenya, Tanzania and Uganda where the weather has a direct impact on livelihoods and often their lives.